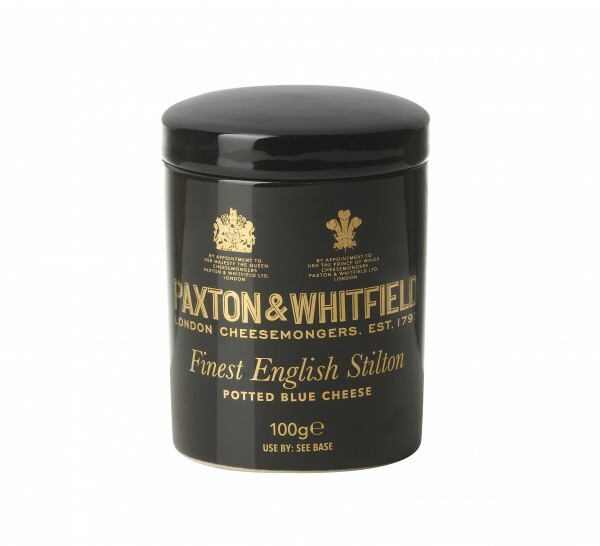 Rich & creamy premium blue Stilton crumbled into a collectable Paxton & Whitfield jar. There has always been a degree of uncertainty about the evolution of Stilton Cheese, but thanks to extensive research we now have a clearer knowledge of the origins and how Stilton Cheese evolved. 19th and 20th Century texts suggested that Stilton Cheese was never made in the village of Stilton and that it simply got its name because it was there that the cheese was first sold. This gave rise to many theories, including that concerning a lady by the name of Frances Pawlett, a renowned cheesemaker from Wymondham, near Melton Mowbray in Leicestershire. It is said that in the 1740s she supplied cheese to Cooper Thornhill, the landlord of the Bell Inn in the village of Stilton. These, we believe, were blue veined cheeses. Historical evidence has also been researched which suggests that a cream cheese was being made and sold in and around the village of Stilton possibly in the late 17th Century and certainly in the early 18th Century. Either way, it is clear that Stilton Cheese as we know it today was developed in the Melton Mowbray area. Some of this Stilton gets chosen to be hand crumbled into our collectable jars, and is then covered with a wax seal to ensure the quality of the product. The Stilton in our Stilton Jars varies greatly from those Stilton to be found on supermarket shelves. The cheese is hand crumbled into the jar, which means the creamy texture is retained, whereas many are extruded.